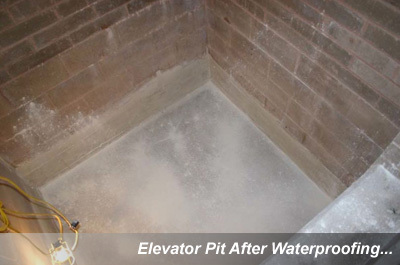 In business since 1993, we have vast experience waterproofing wet elevator pits throughout the New England area. In most states that we service, the state elevator inspectors will require that the elevator pits are dry. If they are not, the inspectors can shut them down and require that the elevator pits be waterproofed. 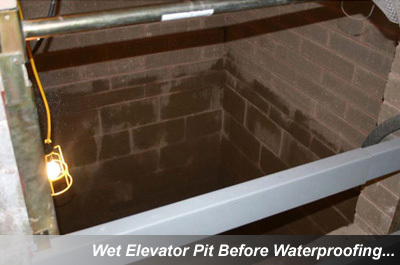 Since the pits are below the basement level, it is not uncommon for them to be prone to the consequences of hydrostatic water pressure. The water can come through any cracks or voids in the concrete. A common area of water penetration is where the cement floor meets the wall of the elevator pit. Water often comes in around the elevator piston collar that goes deep into the ground. On new elevator pits, we often work closely with the engineers or an architect on the specific elevator waterproofing that is needed. 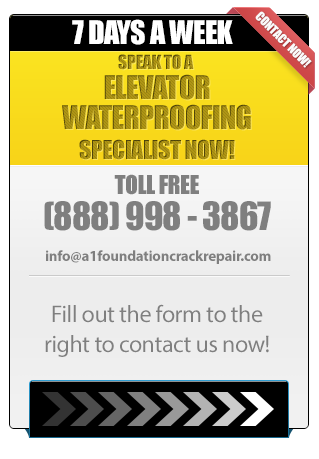 At A-1 Foundation Crack Repair Inc. we use multiple methods to waterproof elevator pits, ranging from injections of closed-cell polymer resins to crystalized quartz based materials.